The Deluxe Signature Head is very strong with the square metal shell but it's still only about one pound. It's sold separately from the Head Cables to allow you to select from 5 to 20 foot options. It works with any Lumedyne Head Cable or Head Extension Cable. The adjustable beep that indicates that it is ready again works with all of the Power Packs. The Head originally does include the reflector, 2 diffusors, a metal snoot and the 800ws Flashtube and a 25 watt modeling bulb. 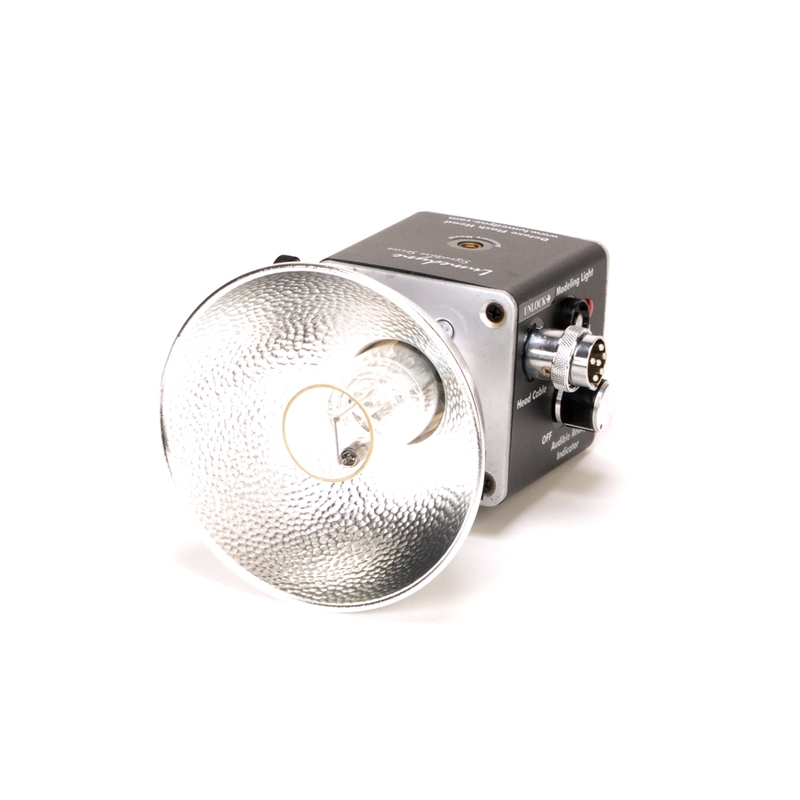 Deluxe Heads are compatible with some separate TTL Modules from Metz™ for limited digital cameras and most film cameras but not Canon™, Nikon™ or similar digital cameras. The Deluxe Signature Head has an adjustable audible beep tone that beeps after the recycling is finished to let you know that the head is ready again. There is a volume knob for that feature. It has a test fire button and another button to turn the powerful 25 watt modeling light On/Off. There are “ready” lights on both sides of the Head. To trigger the Head, you can use one of two sync connections, the household and/or the mini-phone. Deluxe Signature Series Heads can be combined with Deluxe Signature Series Packs to respond to TTL signals for exposure control. This works with Metz™ brand SCA Modules and many film cameras and a few digital cameras like the Hasselblad™ and Phase One™. The Canon™, Nikon™, Sony™ and recent Fuji™ cameras along with many others use D-TTL or i-TTL or something similar that is not compatible with the TTL features from Lumedyne. These brands can all be used together with the Deluxe Lumedyne (or other Lumedyne kits) as a manual flash system without any problem. We recommend that you contact DJ LaDez, at Lumedyne, if you are interested in exploring the TTL features in more detail. Since most of our photographers do not use TTL features, they would select this Head to have the strength of the Signature Series Heads and the adjustable ready beep at the end of recycling. While some do not care for a beep tone, others appreciate the audible confirmation that it is ready again as part of the confirmation that it flashed as well. This is particularly helpful when muliple Heads are being used at once. The Signature Series Heads have been revered as the strongest of all brands of portable flash heads. They are designed to be strong but still weigh just over one pound. If you feel that you are rough on your equipment, this is the right type of Head for you because it has an aluminum frame and front and rear plates so it is physically very strong. The Signature Heads are sold separately from their Head Cables to allow you to select from 5 to 20 foot long Head Cords or the Coiled option. It also makes it convenient for those who pack their gear in cases for transport and want to separate them. Contact Lumedyne if you desire longer cords. All of the Lumedyne Heads have electronics that can handle 2400ws, however, the flashtube that is installed in your Head will determine the maximum power that you should flash through the Head. This HEDM Head has a 800ws rated flashtube (AFTE) in it when we built it. If you want to shoot over 800ws, then you can exchange the tube for a 2400ws Quartz version (AFTQ). Remember that all of our flashtubes are rated for tens of thousands of full power flashes or one face down fall onto a hard surface, they are made of glass... it’s a good thing to have a back up of the flashtube and this Head has the AFTE Modeling Flashtube installed originally. The separate Modeling Bulb is the AMBR.